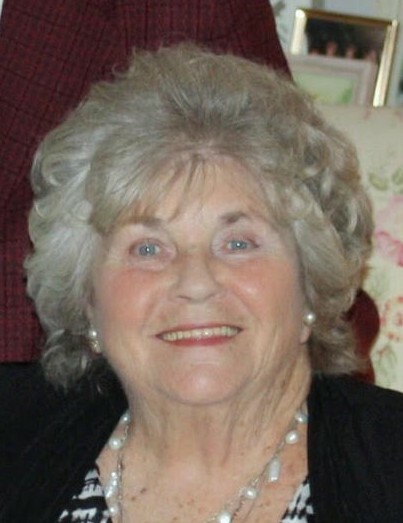 Margaret N. Hochendoner passed away peacefully on February 7, 2019 at Austinwoods Nursing Center in Austintown, Ohio. Margaret (Marge) was born February 17, 1930 in Pittsburgh, PA., a daughter of the late William and Loretta Mundy Artman and together with her husband and children moved to Lake Milton in 1969. Margaret was a 1948 graduate of St. George’s High School, Pittsburgh, PA., where she excelled in basketball, was Band Majorette and a member of the Drum and Bugle Corps. She earned the nickname “Nutsy” from her group of childhood friends who were dubbed “The Rackets” because they had so much fun and made so much noise playing in the neighborhood streets. Marge worked long hours during and after high school at her family’s “Artman’s Tavern” in Pittsburgh, PA. She was a fun loving person, a great dancer and a league bowler. Margewas a member of Our Lady of the Lakes St. Catherine Parish, Lake Milton, Ohio where she was very active in the Ladies Guild. She gave a great deal of her time over the years to the Church, the Jackson Milton Athletic and Band Booster Clubs,PTA and PTC clubs, Cub Scouts, The Friends of the Library, The Lake Milton Women’s League, American Legion Post 737 Auxiliary and VFW Post 9571 Auxiliary. She enjoyed boating,entertaining at her home on Lake Milton, cooking, candy making and all sports at all levels and she was never without her “Terrible Towel”! Holidays were always a grand affair in the Hochendoner home. Her husband of 48 years, Jerome J. Hochendoner, whom she married December 28, 1950, passed away May 28, 1999. She was also preceded in death by her son Jerome W. Hochendoner; her daughter Melinda S. Booth; her grandson Lee M.L. Booth; 6 brothers: William, Edward, Raymond, Robert, James and BruceArtman and 3 sisters: Crystal Denryter, Annamarie Santamaria and Laverne Jean Ruiz. Margaret leaves two sons, Daniel (Jackie) of Gwinn, Michigan and Jefferey (Michele) of Mills, Wyoming; four daughters, Debra (Bob) Boyer of Lake Milton; Laura Hochendoner of Austintown; Michele (Jim) Butler of Lake Milton; Cynthia (Bob) Schnellbach of Lake Milton; thirteen grandchildren; nine great grandchildren; a brother, Bernard C. Artman of Pittsburgh, PA. and many nieces and nephews. There will be a Mass of Christian Burial Thursday, February 14, 2019 at 10:00am at Our Lady of the Lakes St. Catherine Parish officiated by Father David Merzweiler with burial to follow at Jackson Township Cemetery, North Jackson, Ohio. The family wishes to thank the staff of Austinwoods Nursing Center and Crossroads Hospice for the care given and the kindness shown. In lieu of flowers, memorial contributions may be made to The Linda S. Booth Endowed Scholarship C/O THE KENT STATE UNIVERSITY FOUNDATION, INC. KENT, OHIO 44242-0001. Professional arrangements are being handled by Higgins-Reardon Funeral Homes, North Jackson Chapel.